Their present wasn’t too bad, either. 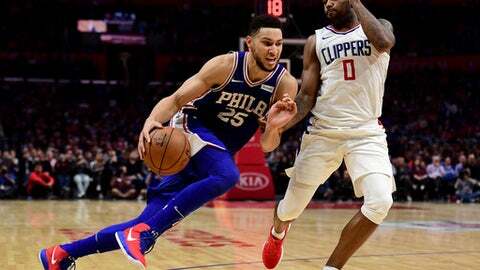 Philadelphia has several talented young players and three of them – center Joel Embiid, forward Robert Covington and guard Ben Simmons – had it all working in a 109-105 victory over the Los Angeles Clippers. ”He’s a difference-maker,” said Sixers coach Brett Brown. ”He is a game-changer at a 6-10 point guard position. Some of his passes tonight, some of his finishes tonight, some of his loose balls and 50-50 balls – he’s different. Embiid fouled out Jordan and his backup, Willie Reed. The 76ers’ big man went to the line 16 times. ”That reflects a mentality way more than a statistic,” Brown said. ”And his mentality tonight was dominant. 76ers: Injuries to Markelle Fultz, Jerryd Bayless and Nik Stauskas have made it difficult for Philadelphia to sustain an early rhythm, and players are going to have to get into shape during the season. Said Brown: ”This is not a normal pathway to bring somebody back, but that’s the best we can do.” … Philadelphia also was without Jahlil Okafor (respiratory infection).